There are many great things to list about the condo. Please, first scroll all the way down to see the pictures that are worth a thousand words... Rest-assured that your family and friends will be staying in a clean, well-appointed condo featuring many fantastic amenities. You'll appreciate The Home Theater system and comfortable living area. Bring along your laptop and log onto the Internet at High-Speed! The Kitchen is fully-equipped and the Weber Gas Grill is awaiting your Barbeque! The spacious Master Suite has a King-Sized Bed and private bath with a jetted tub and separate shower. The Second and Third Bedrooms offer comfortable Queen-Sized Beds and Cable TVs with DVD players. You'll love sitting out on the Deck that has an amazing view overlooking Parkview Bay, the Lake, and the serene state park just across the water. BOATERS: Our 14 x 40 foot slip is close by and available upon request. The State Park is just a short drive away and offers very nice ramping facilities as well as short to long-term trailer parking for your Boat or Personal Watercraft Trailer. By water, you'll be on the 2 Mile Marker of the Grand Glaize Arm near the Grand Glaize Bridge! The Bridge is off the 19 MM of the Lake's main channel. GOLFERS: You've surely heard of the awesome courses the Lake area boasts. All of them are just a short drive from the centrally located Parkview Bay Complex. Bring those Clubs! Hello, My name is Jason Boschert and I'm pleased to be the Property Manager for this fantastic Parkview Bay Condominium. Please feel free to contact me with all of your questions, for any needs during your stay, and if you'd like any recommendations for things to do while visiting the Lake of the Ozarks. As the property manager, I'm working for you as well as the property owner! My goal is to provide a relaxing, worry-free getaway with the best amenities to accommodate our guests. The Towers at Parkview Bay is one of the most impressive condominium developments at the Lake of the Ozarks. The location is fantastic, within minutes of the lake area attractions including the Factory Outlet Mall, Restaurants & Bars, Grocery Stores, and Entertainment! You simply can not find the amenities offered at the Towers elsewhere! No Steps from Pool & Docks to 9th Floor! 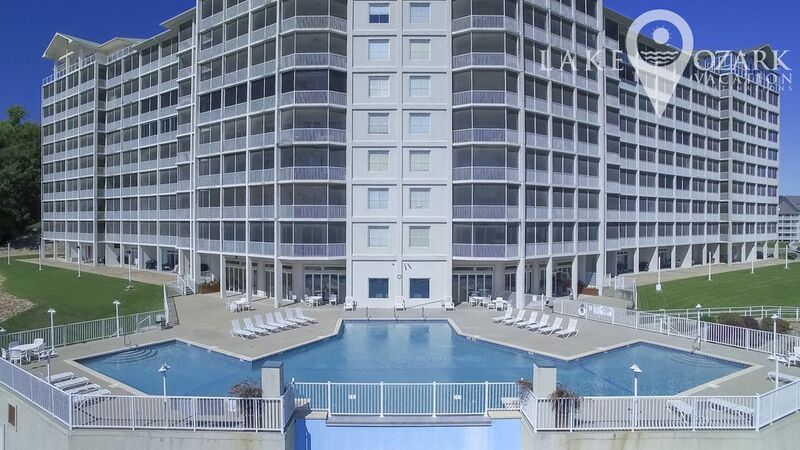 The Towers offers Heated Indoor and Outdoor Pools plus a Hot Tub and Sauna! Arcades, Boat Rentals, Bumper Cars, Go-Karts, Helicopter Rides, Mini-Golf, Indoor and Outdoor Water Parks. The Towers at Parkview Bay is one of the most impressive condominium developments at the Lake of the Ozarks. The location is fantastic, within minutes of the lake area attractions including the Factory Outlet Mall, Restaurants & Bars, Grocery Stores, and Entertainment! The Towers Complex offers an Indoor Pool with Hot Tub and Sauna, A Huge Lakeside Outdoor Pool with an Infinity Edge, and an Exercise Room. You can't find amenities like this elsewhere! Other attractions include the Osage Beach State Park at 2 miles away and the Ha Ha Tonka State Park at 16 miles away. By water, Parkview Bay is located at the 2MM of the Grand Glaize Arm which is off the 19MM of the Lake's main channel.